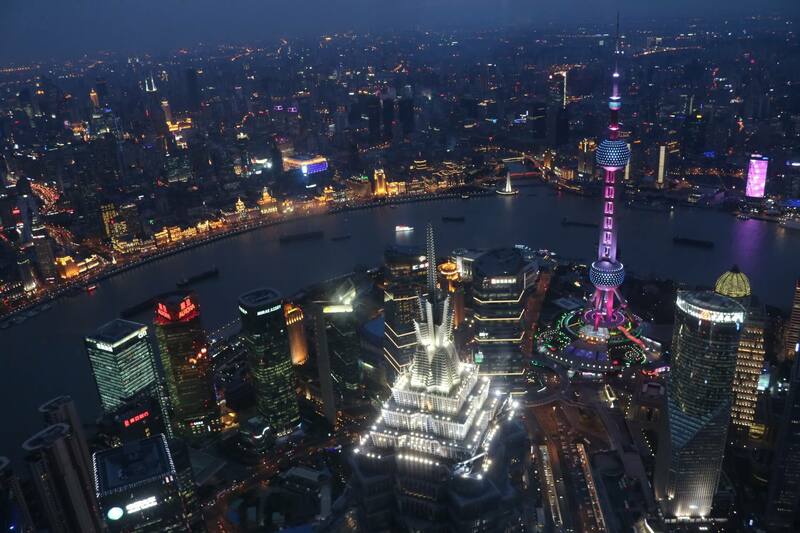 At a population of 24 million, Shanghai is China’s biggest city. With the futuristic skyscrapers of the Financial District and the traditional Yu Gardens, it has a delightful mix of old and new architecture. In this guide, discover the must-see sights in Shanghai as well as interesting museums and lesser-known tourist destinations. The Bund is a waterfront promenade next to the Huangpu River. Facing the towering skyscrapers of Liujiazui, it is the perfect place for a leisurely stroll. I recommend checking it out both during the day and at night! Shanghai’s Financial District (Liujiazui) has 3 skyscrapers that tower above the rest: Jin Mao Tower, Shanghai World Financial Center and Shanghai Tower. Nearby is the Oriental Pearl TV Tower. I have been to the observatories in Jin Mao Tower and the Shanghai World Financial Center. Jin Mao Tower has excellent views and you can also peer down at the lobby of the Grand Hyatt hotel from 88 floors above! I went to Shanghai World Financial Center to watch the sunset. It a very special experience to watch the nearby buildings light up, especially the Oriental Pearl TV Tower, which flickers and sparkles in many different colours. View from the Observation Deck at the Shanghai World Financial Center. Shanghai World Financial Center, Jin Mao Tower, and Shanghai Tower. Once the largest park in Shanghai, Fuxing Park in the French Concession is brimming with culture. It’s a charming place to spend a couple of hours observing the locals. During my visit to the park, I saw locals doing many interesting things such as practicing Tai-Chi, playing mah-jong, playing cards, and dancing. I also saw a man practicing calligraphy on the sidewalk, which drew a small crowd. On one side of the park, a band was practicing. On the other side of the park, elderly men were debating politics while others stood to read the daily newspaper, the pages of which were mounted in display cases. A group of men debate politics. Located in the basement of an apartment building in the French Concession, this museum features many posters from the Mao era. If you have trouble finding it, ask a security guard for help. Each poster title has an English translation and each time period has a summary in English and French. There is a gift shop where postcards, books, posters and Mao paraphernalia are available. Bring cash as cards are not accepted. The Museum of Urban Planning is a great place to learn about how the city of Shanghai grew and changed over time. The huge model of the city is the highlight! A model of Yu Garden during its early years. Tianzifang is a labyrinth of alleys filled with cafes, boutiques, restaurants and galleries. It has a more traditional atmosphere than Xintiandi. Totoro Latte at Rock Princess Cafe. Dolls at Rock Princess Cafe, Tianzifang. Xintiandi is a pedestrian street that features a combination of Shikumen-style buildings and modern buildings. It is well-known for its upscale international restaurants (French, Italian, etc.) and shops. It is also the site of the First Congress of the Chinese Communist Party. If you are interested, you can visit the Museum of the First National Congress of the Chinese Communist Party. Yu Garden is a traditional Chinese garden built during the Ming Dynasty. Filled with beautiful pavilions, rock gardens and ponds, it is a nice place to step into the past and take a break from modern Shanghai. Outside the paid area of the garden, there are shops and restaurants aimed at tourists. These restaurants are most famous for xiao long bao, a soup-filled dumpling. Try not to come to the area on weekends, as it is always extremely crowded. Crowds in the Yu Garden area on a weekend. In 2010, millions of people visited the Expo in Shanghai. After the Expo, most of the buildings were demolished, with only the Chinese Pavilion (now China Art Museum), the World Expo Cultural Centre and the River Mall remaining today. The World Expo Museum is now an art gallery. It is definitely worth spending a few hours here. When I visited in March the Expo site was quiet with very few tourists. Shanghai Museum houses a collection of more than 120 000 rare historical relics such as furniture, ceramics, paintings, bronze and calligraphy. In the Chinese Minority Nationalities’ Art Gallery, you can view the dresses, embroidery and ceramics of the minority people. The museum is shaped like a bronze ding (a cooking vessel) and symbolizes China’s “round sky and square earth” perception. Nanjing Lu is Shanghai’s main shopping street. It is best experienced at night to enjoy the view of the flashing neon signs on the buildings. There is a sightseeing train that can take you along the road if you want to have a rest. A nighttime riverboat tour is a magical experience. Stand on the top deck of the boat to enjoy the cool breeze while admiring the skyscrapers on one side of the river and the colonial buildings on the other. China is famous for its hard-working and talented acrobats. At Shanghai Circus World, you can watch amazing acts such as juggling, hoop diving, trampoline and stunt bicycle riding! I went to the ERA- Intersection of Time show and was very impressed! Located at the base of the Oriental Pearl TV Tower, this museum features interesting exhibits about the history of Shanghai. With impressive dioramas, wax figures and music, this museum is a must-see if you are interested in history! This spacious, modern museum was opened in 2015. It has dinosaur skeletons, fossils, taxidermied animals, and models of sea monsters. My favourite exhibit was the T-rex- it suddenly roars every couple of minutes! A lion at the museum stares at passerby incredulously. There are many traditional water towns near Shanghai. Water towns have canals and bridges, and in these towns, you can pay for a boat ride along the canals. If you pay extra, your gondolier will sing traditional Chinese songs for you. I went to Zhouzhuang Water Town and enjoyed it. You can read about my experience here. Other popular water towns near Shanghai are Tongli, Zhujiajiao and Qibao. All these towns are easily accessible by public transit. Haha, I’m glad that I may have changed your mind! Great post, really interesting especially the part where the men are reading the newspaper from display cases. I’ve never looked too much into China as a destination before (other places have taken priority) but whenever I do make it there Shanghai is now high up on the list. Fuxing park, Tianzifang and the water gardens all sound amazing. And that Totoro coffee! ???? I really like this post, particularly how you have a broad range of attractions and experiences described. I didn’t realise there was a Propaganda Art Poster Centre in Shanghai – I really love that type of art – so will definitely make a point of putting in on my list when visiting. Great pics too. I like how you add nice photos to the article. China is just next door to where I am now. Thanks so much for the great post! I will come to Shanghai in November, your post helps me so much plan the itinerary there. Keep up with your good work!